Ayoze Perez gave Newcastle a narrow victory over fellow Premier League strugglers Stoke to put more pressure on under-fire Stoke manager Mark Hughes. Hughes made six changes to the side thrashed 5-0 by Chelsea on Saturday, but his gamble failed to pay off as his side delivered another lacklustre performance. Christian Atsu missed a host of chances for the visitors in the first half and Ciaran Clark fired over from two yards before Perez gave Newcastle the lead with a neat finish from Jacob Murphy's cross. Newcastle have secured successive Premier League away wins for the first time since November 2014 and move up to 13th in the table, while Stoke fall to 16th. Before Monday's game Hughes said changes to his team were "necessary" during a hectic winter period. In a must-win match he brought back the attacking flair of Joe Allen, Eric Maxim Choupo-Moting and Xherdan Shaqiri and would have expected a response from his players. But it will be Hughes' counterpart Rafael Benitez who will take the plaudits after his five changes saw a goal-shy side edge the crucial game. Hughes rested a number of key players against Chelsea with the home game against relegation rivals Newcastle in mind - a decision which has been heavily criticised. And after a fifth defeat in seven matches, the Stoke boss has invited yet more scrutiny over his team selection. With his side perched precariously on the edge of the relegation zone it was a calculated risk to put all his eggs in one basket, but it didn't pay off. Erik Pieters returned from injury and with Kurt Zouma available for selection, the Potter's leaky defence - which has conceded a league-high 47 goals and only kept two clean sheets this season - looked more assured. They were helped, until the 73rd-minute, by the visitors' lack of confidence in front of goal but Newcastle asked questions throughout and when the inevitable happened, Stoke had little response. There was a goalmouth scramble at the end of the game when Mame Biram Diouf twice failed to find the back of the net, and they were denied by a good performance in goal from Karl Darlow, but their rested players injected little attacking intent. Newcastle had failed to score in four of their previous five matches, but their pacey counter-attack troubled Stoke from the outset. Questions were asked when Atsu started the game alongside Ayoze Perez but the two combined well all afternoon. Atsu had his first chance of the game when goalscorer Perez, brought into the side by Benitez after the 0-0 draw against Brighton, made a nice run through the middle and fed the Ghanaian, who saw his shot deflected by Zouma. Winger Atsu could have had another when he picked up a loose ball on the edge of the box, but drove his strike over the bar before sailing a third chance straight into the hands of Jack Butland - all inside the first 15 minutes. In a dominant first half, Newcastle's most clear-cut chance came when Perez flicked on a corner to Clark, who clumsily thumped the ball over the bar. And while there were still rumbles in the crowd over the sale of the club, the fans were left celebrating when a focused performance from the players on the pitch culminated in Perez's goal and three vital points. Stoke manager Mark Hughes was defiant in his post-match interview. When asked if he thought he would remain in his position, the Welshman replied: "Who else is going to do the job? In terms of the knowledge of the group and the progress in my time here I'm the best person to do it. "Everyone's saying that I gambled but I used the players that I had, what was I going to do? Risk players that had a big part to play today? Plenty of teams have made changes today, everyone is doing it too. "We deserved something out of the game but we didn't get it, you've got to pick yourselves up and get on with it. "The players are frustrated, disappointed, but that's a consequence of the high standards that I've set here. There's no use feeling sorry for ourselves." Newcastle manager Rafael Benitez: "We started the game very well and defended well and in the end I think we deserve the win. "For us it's good, for them it's bad, but for both teams you can see the players are working very hard. "We know we are looking for something that can improve the team in different areas. The players are trying everything and I am pleased with them but if we can improve our squad we will try to." Newcastle have won back-to-back away Premier League matches for the first time since November 2014. Rafael Benitez has lost just one of his 13 managerial matches against Mark Hughes in the Premier League (W6 D6 L1). Newcastle have beaten Stoke home and away for the second time in the Premier League, having previously achieved this back in 2011-12. Today's result was Stoke's first home league defeat on New Year's Day since 1988. The Potters have failed to keep a clean sheet in any of their past 10 Premier League home games - their longest such run in the competition. Stoke have now conceded the first goal of the game on 15 occasions in the Premier League this season; more often than any other team. Ayoze Perez's strike was Newcastle's first goal at the bet365 stadium since November 2012 (first goal in four visits). Stoke's total of 20 points after 22 games is their worst haul at this stage of a top-flight campaign since 1984-85 (11 points). 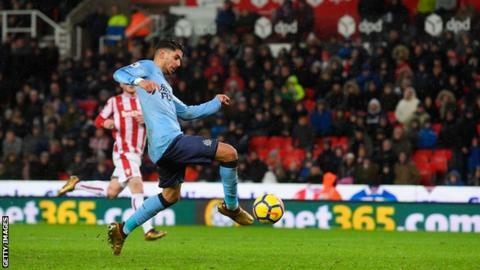 Stoke face a trip to Coventry in the third round of the FA Cup on Saturday, 6 January (15:00 GMT) before an away fixture against Manchester United in the Premier League on Monday, 15 January (20:00 GMT). Newcastle are also in action in the FA Cup third round on Saturday as they host Luton Town (15:00 GMT) before a second home match against Swansea in the Premier League on Saturday, 13 January (15:00 GMT). Match ends, Stoke City 0, Newcastle United 1. Second Half ends, Stoke City 0, Newcastle United 1. Attempt saved. Isaac Hayden (Newcastle United) right footed shot from the centre of the box is saved in the bottom left corner. Assisted by Dwight Gayle. Attempt missed. Mame Biram Diouf (Stoke City) header from very close range is too high. Assisted by Charlie Adam with a cross following a corner. Corner, Stoke City. Conceded by Isaac Hayden. Corner, Stoke City. Conceded by Javier Manquillo. Attempt missed. Mame Biram Diouf (Stoke City) right footed shot from outside the box misses to the left. Assisted by Kevin Wimmer. Attempt blocked. Thomas Edwards (Stoke City) right footed shot from outside the box is blocked. Assisted by Joe Allen. Corner, Stoke City. Conceded by Mohamed Diamé. Attempt blocked. Saido Berahino (Stoke City) right footed shot from very close range is blocked. Attempt saved. Mame Biram Diouf (Stoke City) header from very close range is saved in the centre of the goal. Assisted by Peter Crouch with a headed pass. Thomas Edwards (Stoke City) wins a free kick on the right wing. Attempt missed. Mohamed Diamé (Newcastle United) right footed shot from the left side of the box is high and wide to the right. Substitution, Newcastle United. Paul Dummett replaces Jacob Murphy. Offside, Stoke City. Charlie Adam tries a through ball, but Mame Biram Diouf is caught offside. Attempt saved. Mame Biram Diouf (Stoke City) left footed shot from the centre of the box is saved in the bottom right corner. Assisted by Peter Crouch. Attempt blocked. Kevin Wimmer (Stoke City) right footed shot from the centre of the box is blocked. Assisted by Kurt Zouma. Goal! Stoke City 0, Newcastle United 1. Ayoze Pérez (Newcastle United) right footed shot from the centre of the box to the high centre of the goal. Assisted by Jacob Murphy. Substitution, Stoke City. Saido Berahino replaces Erik Pieters because of an injury. Attempt missed. Jonjo Shelvey (Newcastle United) right footed shot from outside the box is close, but misses to the right from a direct free kick. Read more on Who tops the 2017 Premier League table? Read more on Who makes your 2017 Premier League XI?